JESUS CHRIST IS LORD OVER THE ENTIRE EARTH! Pastor Max Solbrekken poses with an excuberent Norwegian who had been miraculously freed from bursitis in his crusade. He displayed the new strength he had received from the Lord. This photo was taken in May, 2013 at the 10th. Anniversary of VISJON NORGE T.V. at the Drummand Hall, Norway. 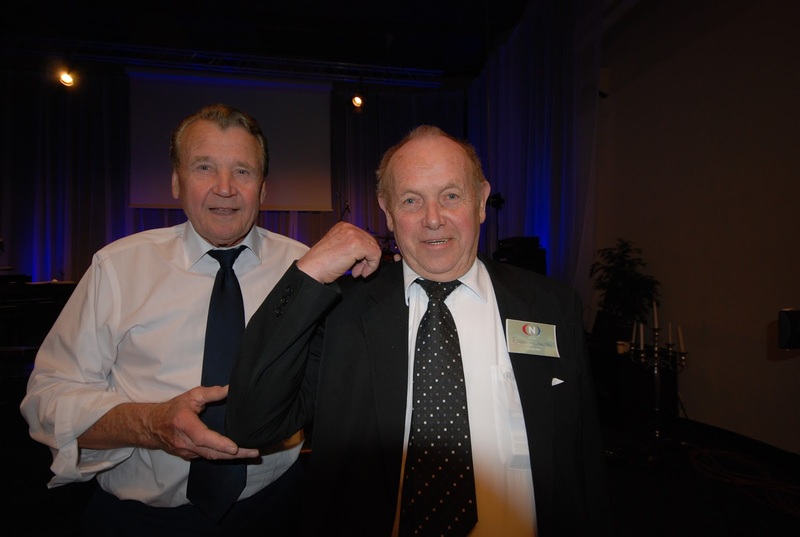 Beginning in 1963, Max Solbrekken has carried the Gospel of Jesus Christ to masses across the world, the Lord working with him and confirming the Word with miracles, sign and wonders! Multiudes have responded to his altar calls for salvation and great numbers have been miraculously healed by our Saviour from many nations, tribes and peoples. From 1989 to 1995 he conducted major crusades across the former Soviet Union. In 2004 and 2005, Max Solbrekken preached in four Ministers Conventions in Brazil with a total of 10,000 preachers. In Parque Brasil in Paulinia, S.P. Brazil, he preached to more than 300,000 people on April 13, 2005. His latest Gospel Unity Crusade was in Kampala, Uganda in 2011. After his 1966, 3 1/2 month long World Crusades and preaching to a tribe of head hunters in Eli, Tabuk in Kalingo Apio, Philippines, an American Journalist asked, "Rev. Max, you preached to the head hunters and you still have your head. How do you account for that"? He replied, "I got to their hearts before they got to my head." The next morning, the journalist's story carried the headline: HE GOT TO THEIR HEARTS BEFORE THEY GOT TO HIS HEAD. One of his greatest joys was preaching in Darfur, Sudan in 2006 and 2007. To God be all the honour, praise and glory, through Jesus Christ the Lord! Amen. GOD ANSWERS PRAYER! By Pastor Max Solbrekken, D.D. JESUS SAID: "Come unto Me all ye that labour and are heavy laden, and I will give you rest." (Matt. 11:28). "And him that cometh unto Me, I shall in no wise cast out." (John 6:37). "Behold I stand at the door and knock. If any man hear My voice and open the door, I will come into him and will sup with him and he with Me." (Rev. 3:20). The Bible is the authoritative, divinely inspired and perfect Word of God! His signature is on the original autographs, written by holy men as they were inspired by the Holy Spirit. Dr. Martin Luther had not seen a Bible until he was more than 20 years old and his colleague Dr. Carlstadt had received his doctorate in theology from a prestigious Roman Catholic Seminary without ever reading the Bible! For hundreds of years the Roman Catholic Church refused Christian laymen the right to read and study the Holy Scriptures. They claimed that it was too deep. “Only an educated priest or theologian could understand God's Word”, they pontificated. A TRICK OF THE DEVIL! Luther replied: "Since your Majesty and your lords desire a single reply, I will answer without horns and without teeth. Unless I am convinced by Scripture and plain reason, I do not accept the authority of popes and councils, for they have contradicted each other. My conscience is captive to the Word of God. I cannot and I will not recant anything, for to go against conscience is neither right nor safe! Here I stand. I cannot do otherwise! God help me. Amen." One hundred years earlier, the 'Bloody Old Vatican Wolf' had given the Bohemian monk Jan Hus a guarantee of 'safe conduct', if he would come to a similar trial. Believing the pope to be honest, he accepted his invitation and was betrayed by the lying hypocrite and turned over to the secular arm to be burned at the stake! Luther stated: "The gospel that we have today has come to us at the cost of the blood of Jan Hus that was spilt 100 years ago." No wonder Martin Luther stated, “The papacy is a general chase (hunting expedition) in which the Bishop of Rome is seeking to capture and bring to hell as many unsuspecting souls as he can”. It is sad but true, Roman Catholic theologians, as well as Mormons, Jehovah Witnesses and other cults, put their own interpretation on God’s Word today! But St. Peter said, "No prophecy of the Scripture is of any private interpretation..."
God interprets the Scripture, Himself! The message He wants us to receive is not what a certain sect or denomination reads into the Scripture, but what He (God) is communicating! How does He interpret the Scriptures? By using other Scriptures which the Holy Spirit has anointed! Scripture interprets Scripture and God does not contradict His Word. When taken in context, you will find that there are NO contradictions in the Holy Bible! The Holy Spirit and the Word of God agree totally, because the Holy Spirit anointed holy men to write the Scripture, and God has no mental block or speech impediment! He said what He meant and He meant what He said. And He honours His Word with His total power and authority! Jesus Christ Himself is the Living Word of God and the Holy canon of Scripture, the Bible, is the written Word of God. Therefore, if you will believe the Word of God and appropriate it for yourself, Jesus Christ will come out of the pages of this holy book and come into your heart. There are more than 33,000 promises of blessings in the Bible and they all have to do with God's dealings with mankind! His promises are not for angelic beings, but for lost, sinful, sick and fallen man. His promises are for you and me! Jesus invited, "Come unto Me, all ye that labour and are heavy laden, and I will give you rest". (Matt. 11:28) The most beautiful word in any language is 'Come'. This is a word of invitation and when Jesus calls, we must always be ready to answer His call! He said, "Come unto Me". He is the only One with solutions to our problems and answers to our questions! While on a visit to the USA a number of years ago, the then Soviet Union's communist president Mikhail Gorbachev stated, "Only Jesus Christ had the solutions to every problem. I don't possess that skill". When asked by US reporters, the reason for glasnost, perestroika and the new freedom of religion which was happening in his country, Gorbachev replied: "JESUS CHRIST"! As startled reporters asked him to repeat his answer, he stated without hesitation: "JESUS CHRIST". Then, as if realizing what he had just said, Gorbachev quickly changed the subject. Christ's invitation is to "all who labour and are heavy laden", and that takes us all in. Gorbachev was right: Only Jesus Christ has the solution to every problem! He promises rest and peace to all who respond to His invitation! And we all need a new meeting with Jesus! No one is exempt from the burdens, frustrations, temptations, pressures, cares, sicknesses and other pitfalls of Satan, the world and the flesh! Testing, temptations and trials come to us all in various forms and fashions. The inability to pay our debts - due to unemployment, unreasonable taxation or sickness - is one of the biggest stress producers in this generation! Our faith is sorely tried as we deal with things like family break-up among children, grandchildren, relatives and friends. Christ Jesus, however, has promised us total victory, a release from tension and an abiding peace as we look to Him alone and keep our trust in His Word! Notice - He didn't say ‘Come to a certain religious body or embrace a certain philosophy, ideology or theology’...but He said, "Come unto Me". Jesus didn't mention His mother Mary or His inner circle disciples Peter, James or John or His brother James who became the pastor of the world's first Pentecostal Church (the church was born on the day of Pentecost and exhibited supernatural signs and wonders) in Jerusalem! He didn't say come to the high priest or rabbi or pastor, evangelist, apostle or prophet! He said, "Come unto Me"! There is not a single account of Jesus ever turning away anyone who came to Him for help. He met the needs of each one! And that is reassuring to know, especially when you are in need of a miracle healing or are in danger and must have an answer to your prayer! I can verify that God is a "God at hand and not a God afar off". (Jer. 23:23) I can confirm that God answers prayer! In 1984, my team and I were conducting a crusade in Northern India, when a staggering miracle occurred. I had planned to have a very large crusade in southern India, where nearly all visiting evangelists conduct their crusades. Previously I had been in the south and central parts of India, but had not ventured into the north where the zealous, devout and often fanatical Brahmin Hindus have almost total power. In fact, for the previous twenty years the number of Christians had declined there each year, as daughters of Christian families were marrying Hindu men because of the low status and dismal financial opportunities for the followers of Jesus Christ among the predominant Hindu population! Thousands of pastors were ready to embrace our ministry in the south, and we were expecting 100,000 persons on the opening night, with prospects of larger crowds as the crusade progressed. And I was excited about going! Then God changed my plans and I was challenged to go to northern India, to a very intellectual city of Brahmin Hindus and Muslims. The Hindus had just completed a ten-day-revival in Amedevad, Gujarat in preparation for our coming, in order to rejuvenate the people in their beliefs and to warn them to stay away from our meetings! On the first night of our crusade, 1/4 million Muslims were in the streets in a gigantic parade, to start 21 days of fasting in a celebration called Ramadan! We started with 3,000 people on the opening night, backed by two Methodist churches. About 120 young people from Asia and Europe - with a group called ‘Christ is the Answer’- had blanketed the area with posters! I PRESENTED THE CLAIMS OF CHRIST! And I quoted St. Paul: "For this is good and acceptable in the sight of God our Saviour: Who will have all men to be saved, and to come unto the knowledge of the truth. For there is one God, and one mediator between God and men, the man Christ Jesus; Who gave Himself a ransom for all..." (1 Tim. 2:3-6). I declared that Jesus Christ was the Son of the Living God, born of a virgin, His Sinless Life, Miracle Ministry, Victorious Death and Glorious Resurrection from the dead! Less than 100 came forward for salvation in the first service, but God performed several miracles of healing in answer to my prayer! The next day, Hindu Religious Leaders decided to drive us out of the Park and conduct another 10 day Hindu revival on the very grounds we had a permit to use! Unbeknown to me, our Crusade Leader had received their letter informing us of their intentions, with a warning of serious trouble if we did not vacate the area that evening! THE LETTER DIVULGED THAT THE POLICE HAD BEEN ALERTED OF A POSSIBLE RIOT AND THAT 50 FANATICS WITH STONES AND STICKS WOULD START AN UPROAR, STOP THE CRUSADE AND KILL THE PREACHER, IF NECESSARY! There were about 6,000 in attendance that evening. I chose for my text Acts 17:18-32 where St. Paul preached his famous Mars Hill message, ‘The Unknown God’. The Bible states that St. Paul was “stirred in the spirit” while he waited for Timothy and Silas, because the entire city was “full of idols”! Invited by the philosophers to speak, he said: “Ye men of Athens, I perceive that in all things ye are too superstitious. For, as I passed by and beheld your devotions I found an altar with this inscription, ‘TO THE UNKNOWN GOD’. “Neither is worshipped with men’s hands, as though He needeth any thing, seeing He giveth to all life, and breath and all things. And hath made of one blood all nations of men for to dwell on all the face of the earth, and hath determined the times before appointed, and the bounds of their habitations: that they should seek the Lord, if haply they might feel after Him, and find Him, though He be not far from every one of us: For in Him we live, and move, and have our being. GOD COMMANDS ALL MEN TO REPENT! “Forasmuch then as we are the offspring of God, we ought not to think that the Godhead is like unto gold, or stone, graven by art and man’s device. And the times of this ignorance God winked at; but now commandeth all men everywhere to repent: Because He hath appointed a day, in which He will judge the world in righteousness by that man Whom He hath ordained, whereof He hath given assurance unto all men, in that He hath raised Him from the dead.” (Acts 17: 16 – 30). Then I presented Jesus Christ, the only true Saviour of the world and the Son of the Living God! At precisely 9:00 PM as I was making the altar call, suddenly loud speakers began blaring out an opposing message - in the Hindi language - in the very same venue which we were using! They had made good on their threat and now they were commanding everyone to vacate the park, because a riot was about to begin! This was no idle threat. These fanatics meant business! On those same grounds, two years previously, the Muslims had started a riot in a Christian crusade, in order to stop the meetings. Muslim fanatics had overturned a bus with 17 men, women and children, poured gasoline on it, setting it ablaze and killing them all! Of course, everyone fled and the Crusade was history! More than thirty years earlier, a well-known American evangelist was conducting a successful crusade in North India. Fanatics began a riot and he had to leave. The Indian government then declared him non-gratis-persona, effectively barring him from the country, stating that his crusades were dangerous and prone to violence and riots. In this manner the bigots and religious fanatics had stopped one of the world's greatest soul winners from preaching in that nation for more than 3 decades! NOW, THEY WERE PLANNING TO DO THIS TO ME, BUT GOD INTERVENED! Just as the fanatics were entering the grounds, I was making the altar call. More than 500 people were so gripped by the message and by the Holy Spirit that they rushed forward to receive Jesus Christ, as a powerful anointing came over me and the entire site! Then as I prayed a powerful prayer, rebuking the devil and calling upon God - in Jesus' Name - for miracles among the people, a 6 year old boy who was lame in one leg from birth was instantly healed! His parents, who were Brahmin Hindus rushed forward to testify, along with their healed son. Upon hearing the commotion and the testimony, the fanatics asked, "Is that Mr. and Mrs. so and so? (a prominent businessman in the Brahmin Community) Is it true that his son is healed? Who is that man? Is he a prophet?" They pulled down their loud speakers! The next evening, the crowd grew to about 10,000 and I preached on ‘God's Love and the Blood of Jesus’! The fanatics who had previously wanted to hurt me, now wanted to kiss my feet. And the revival continued with the crowd growing to approximately 40,000 persons. And according to the last reports we have had, the Christian community was not only strengthened but also is growing! Thousands enrolled in the New Converts Class, by mail. And hundreds took special courses for Christian Ministry! To God be all the glory! At the time of this writing (December, 1992), we have just heard the sad news that another well-known American evangelist has very recently been banned from India for the same reason. Hindu fanatics took over his crusade declaring that he was fabricating lying testimonies of people who claimed to be healed! JESUS BIDS US COME TO HIM! We are invited to call upon Him in the day of trouble and He will deliver us and show us His mighty arm outstretched, in signs, wonders and miracles! All we must do is call, and He will answer! It is humbling for us to acknowledge our weakness and need for help. It is humbling for us to request assistance from an outside force in this proud, efficient and materialistic world in which we live. The simplest thing in the world for anyone to do is to ask for something. And yet, it can be the most difficult! To ask God for forgiveness, we must acknowledge our failings and sins. To ask God for guidance, which road to take or for strength, we acknowledge our weakness. And to ask God for divine healing, we admit that we are sick and need help! But Jesus made it so easy! He said, we must become like little children and ask with child-like faith and expectation. And His promise is sure and guaranteed to work. He will keep His Word! LOST & POWERLESS AGAINST SATAN! We must remember Who our Source is! Jesus Christ is our Redeemer and the Holy Spirit gives us the power to function by His grace. And the Word of God is Supreme that He may be all in all! WE MUST ASK IN FAITH! When we approach God’s Throne of Grace, we must ask specifically for what we need or desire! We must be specific, so that we can prioritize our request and focus on our needs! It is important to lay out our needs in a definite request, believing that He hears us and will keep His promise! Faith is expecting an answer when you pray! Faith is trusting God so explicitly, that when you have met the conditions that He has set forth in His GREAT DOCUMENT - the Holy Bible - He will respond favourably! The Bible says, "Now faith is the substance of things hoped for, the evidence of things not seen". (Heb. 11:1). Here is Moffat's translation of this verse: "Faith means we are confident of what we hope for; convinced of what we do not see." Faith is like the title deed to a property you own but have never seen. You know it is yours because it has been bequeathed to you in a will or it has been given to you as a gift ~ possibly in another part of the world ~ and you still haven't received it or seen it. That is how faith works! You have God's promises regarding prayer and His desire to answer, but the things you prayed for may not have happened yet! Keep on trusting, expecting and believing, and the answer will come! Loved ones will come to Christ, sicknesses will be healed by God's power and your many prayer requests will be answered when you pray in the Name of Jesus! We have His Word on it! "And Jesus answering saith unto them, Have faith in God. For verily I say unto you, that whosoever shall say unto this mountain, Be thou removed, and be thou cast into the sea; and shall not doubt in his heart, but shall believe that those things which he saith shall come to pass; he shall have whatsoever he saith. “Therefore I say unto you, What things soever ye desire, when ye pray, believe that ye receive them, and ye shall have them." In my opinion, Heb. 11:1 is a theologian's definition of faith. The layman's definition of faith is found in verse 6. 1). Faith is coming to God with your needs and making your requests known to Him! When you bring your request to God in prayer, you are declaring your faith in Him! By asking God for help, you are demonstrating faith! You wouldn't come to God for help if you didn't believe He could help you! This is proof that you do believe that He is greater than yourself and your need! 2). Faith believes that God exists! Faith is believing that God is real, that He is alive and available today! But,you may ask:“Who is God?” That question has been asked repeatedly for thousands of years. Here are some truths about God from two historical creeds of the Church. He is eternally existent in three persons: God the Father, Son and Holy Spirit! God is omnipotent (all powerful), omniscient (all wise), omnipresent, (everywhere present at once), incomprehensible (unknowable), transcendent (above nature), eternal (without beginning and without end) and immutable (never differing from Himself). Faith is: Believing that Jesus Christ is the Son of God and that He died on the cross for our sins and arose from the dead for our justification! Faith is: Believing in the God of the Bible! 3). Faith is expecting a miracle when we pray! Faith anticipates and awaits the imminent answer from the eternal, living and trustworthy One, Whose name is Faithful, True and Holy! Faith is a reality! Faith is a fact and faith is also an act, because "faith without works is dead being alone". (James 2:26) Faith is now! Faith is a present day reality and faith gets the job done! Yes, indeed my friend: Faith Works Miracles! I close this brief paper with these words from St. John: “He that believeth on the Son of God hath the witness in himself: he that believeth not God hath made Him a Liar; because he believeth not the record that God gave of His Son. “And this is the record that God hath given to us Eternal life, and this life is in His Son. For he that hath the Son hath life; and he that hath not the Son of God hath not life. May the Blessed Holy Spirit make these precious truths real to each and every one reading these inspired words. Amen.